First date with the Boberg XR9-S.
Well, we’re having another delightful warm spell here in mid-Missouri, so yesterday afternoon I took advantage of it and went out to the range to give the little guy a try. As I noted before, I have actually shot this particular gun a couple of times previously, and just loved it. But it had been a while, and I couldn’t remember specifically what ammo types we had used. So I packed up what variety of 9mm loads I had on hand, along with my chrono, and went to see whether anything had changed. Because of the way they operate, the Boberg pistols have a tendency to be very particular about what ammo they like. Ammo which doesn’t have a sufficient crimp is prone to separate (the case being jerked away from the bullet). 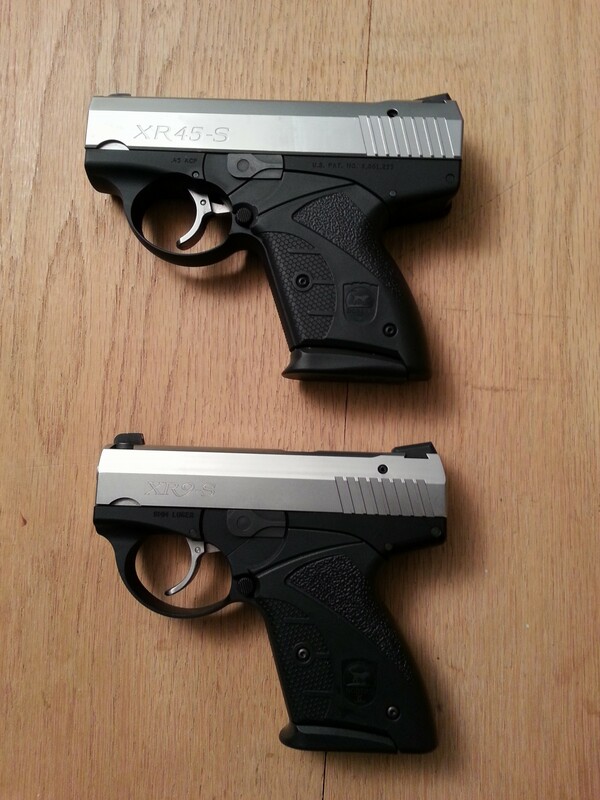 It’s an issue which is well known, and there’s a list of compatible ammo for both the XR9 and the XR45. But while those crowd-sourced lists are useful, the final word is always what specific ammo your particular gun will handle. For me, that’s particularly something I want to determine for any self-defense pistol before I will carry it. Full details to follow, but for those who just want the short version: oh baby! The XR9 ate everything I fed it without a problem. Including my standard 9mm reloads. No mis-feeds. No bullet separation. No problems. And it was a real joy to shoot, which isn’t something I normally say about a pocket pistol handling full-power SD loads. Below are informal* chrono numbers for seven different ammo types I had. These are all for the Boberg. But I also ran a few through my Steyr S9 for comparison, which usually just had an advantage of about 10 fps over the Boberg (the barrel on the Steyr is about a quarter of an inch longer). If that much. As you can see, all pretty respectable numbers. And in keeping with both the claims of the manufacturer as well as what we had tested previously (where there’s overlap). I wouldn’t have any qualms carrying any of the Speer ammo, but my preferred SD ammo is currently the Buffalo Bore. Happily, the Boberg shot all of them without a glitch. And after getting my chrono numbers, I ran several magazines worth through the gun doing some quick shooting at cans, was getting excellent accuracy from it at about 15 yards. I brought it home, stripped and cleaned it, and now consider it reliable enough to carry. Of course, I will continue to practice with it regularly, and keep a close on on how it performs with my reloads, and occasionally run a mag of carry ammo through it, but I don’t expect any problems. It’s a nice little gun. *By ‘informal’, I mean just using one chrono and without the lighting rig we now use for formal testing. And I would just run a magazine of ammo through, mentally noting the numbers in a running tally, then writing them down for that particular ammo, so they are necessarily just ‘ballpark’ figures. But since they jibe well with our previous numbers and what the mfg claims (which I only discovered when I sat down to write this), I think they’re pretty good.